Barrow Raiders prop Brett McDermott has been banned for six matches after the RFL Disciplinary Committee found him guilty of stamping and punching. 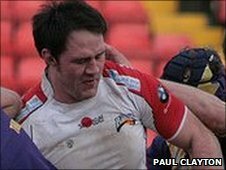 The 32-year-old was banned for four matches for stamping on York City Knights forward Ben Jones in a 24-20 home win on Sunday, 6 February. He also received a further two game ban for punching York winger Danny Wilson in the same fixture. McDermott, who pleaded guilty to both charges, was also fined £50. Meanwhile the RFL committee have also handed a one-match suspension to Widnes Vikings front-rower Steve Pickersgill, after he admitted to making a Grade B dangerous throw tackle against London Skolars in the Northern Rail Cup, also on Sunday, 6 February.